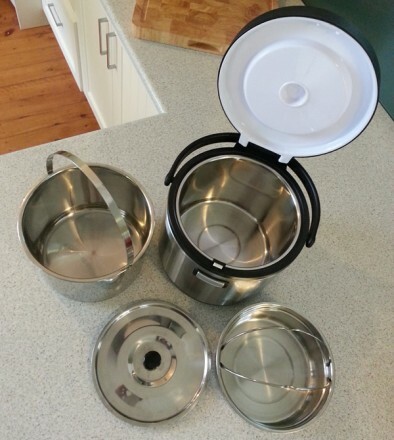 A Thermal Cooker – the Bunyip’s Thermopot ! Do you want a hot, cooked meal when you get back to the van or camp ? But you can’t leave the stove on, or the fire burning ? And you’re sure not going to stay behind looking after the dinner while everyone else is having fun ! You need the Bunyip’s Thermopot ! 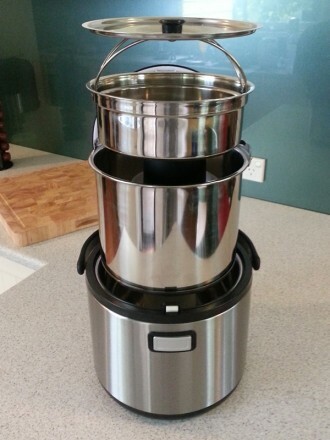 The Bunyip’s Thermopot is an energy efficient thermal cooker. An insulated cooking system that traps the heat inside. You simply start the cooking process using just about any available heat source, then put it in the outer pot somewhere out-of-the-way to continue cooking. Get one from the Bunyip’s shop NOW ! A thick sandwich-bottom on the inner cooking pot : a 2nd internal pot to separate two parts of the meal : quality seals. You can probably see these things in the pictures on this page. It uses a fraction of the normal energy needed while cooking. So use it at home as well to reduce power bills. Simply start the cooking process on your stove or gas-burner, then let the Thermopot continue the cooking. You don’t need to watch it any more. 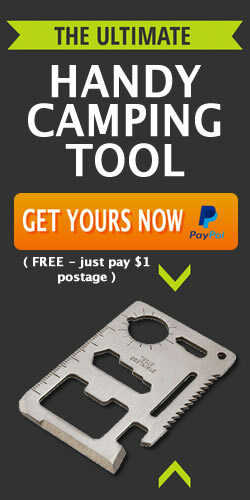 It is ideal for camping and traveling. When you get back home from work late, it’s not often you feel like cooking dinner. This is perfect for working families. Prepare your evening ( or lunch-time ) meal in the morning, then leave it cooking in the pot ready for you to eat when you get back home from work, or get back to your campsite. It’s similar to an electric slow cooker, but without the need of electricity for the majority of the cooking process. Start cooking your food by placing the inner pot on the stove or gas burner, then transfer the pot into the Bunyip’s Thermopot & close the lid. Some cheaper thermal cookers don’t have the heavy base needed for even cooking. This can cause the food to catch or dry out. And often, the cheaper ones have poor closing and sealing mechanisms that don’t trap the heat in properly. A vacuum-sealed, heavy-based pot, for extra heat retention and stability and improved closing and sealing mechanisms. 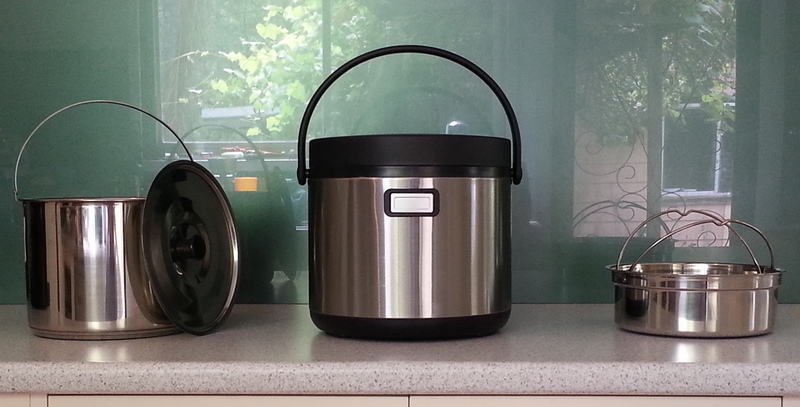 One 6 litre stainless-steel, sandwich base cooking pot. 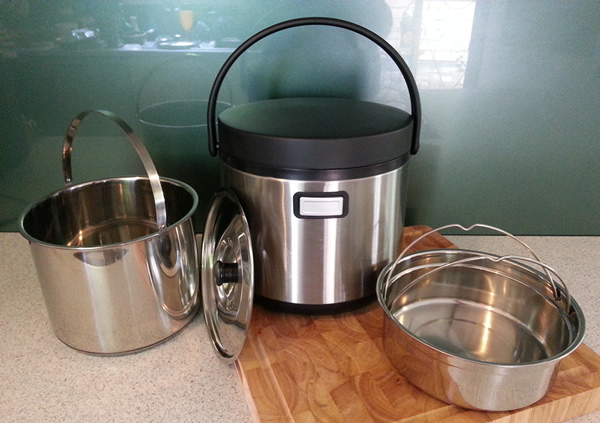 One 3 litre stainless-steel pot. It’s just $179 other brands sell a similar product for $329!